Home of Choice Theory, Reality Therapy & Lead Management. 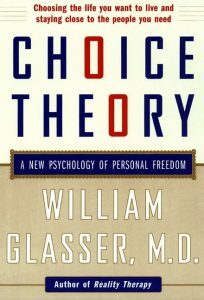 According to Dr. William Glasser, a world-renowned psychiatrist, Choice Theory is an internal control psychology. It maintains that all behaviour comes from within us. Most of the time we choose our behaviour. We choose the best behaviour to satisfy our need or needs at the time. Choice Theory puts the responsibility onto the individual who must accept the consequences for the choice made. • that we are driven by our genes to satisfy five basic needs: survival, love and belonging, power, freedom and fun. Those who practice it have learned that they choose everything they do. They learn they can control their own choices but they can’t control what any one else chooses. For all practical purposes, if we choose everything we do, it also includes the misery we feel. Other people cannot make us miserable nor can they make us happy. All we can get from them or give them is information. But by itself, information cannot make us do or feel anything. It goes into our brains where we process it and then decide what to do. Choice theory teaches that we are much more in control of our lives than we realize. Unfortunately, much of that control is not effective, for example, you choose to feel upset with someone, then you choose to yell and threaten, and things get worse, not better. Taking more effective control means making better choices as you relate to other people. Our behaviour is a function of our decisions, not our conditions – it is not what is happening to us that is important, but how we react to what is happening. Therein lies our choice! COPYRIGHT © 2018 ASSOCIATION FOR CHOICE THEORY SOUTH AFRICA. ALL RIGHTS RESERVED.